Google is starting to do exactly what everyone thought they would and combining more and more of the content from Google+ (their social network - and if you´re not a member get cracking!) directly into search results. Today they have announced that you can control your search results to include the personal "social" results and/or global results in a Google Blog Post. The important thing to consider is how all this affects you when you´re seeing where your web site fits in the search results. 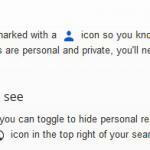 Their announcement of "social search" will mark results with a small "person" icon to indicate those that are personal. You can also toggle the personal result off if you wish by clicking a globe icon at the top. In addition to their blog post they have an intro to Social Search page that outlines the changes. It is becoming increasingly important to look at how you are viewing search. You may even want to go so far as to install a different browser and not log into Google when doing "test searches" Even then your results will be greatly influenced by your location which is determined by your IP address. Having the Google [+1] button on your web site is now almost a ´critical´ addition. We have provided this in the XDe CMS since 2 days after Google released the API and the fact that it´s now taking such a prominent role in search is really no surprise. If you don´t yet have it on your pages you really need to consider adding it. Search results in the primary search engine show who +1´ed a page to anyone that knows those people. In effect ´highlighting´ these results and making them far more likely to get clicked. All these changes are transforming search from being related to the best content to more of a popularity contest - while in some cases this will still favour the best content, in many other cases it will just favour whoever is already the most ´known´ making it far more challenging for the new comers to even get heard at all. Regardless of your take on all these changes, it´s critical to understand them so you know what you´re looking at when you do searches and evaluate your own business´ position.